We’re fond of a good facial oil here at TWR, particularly if it’s a rose scented one and if you do nothing else to your beauty routine this year we’d advise adding a serum or oil to it (use before moisturising). 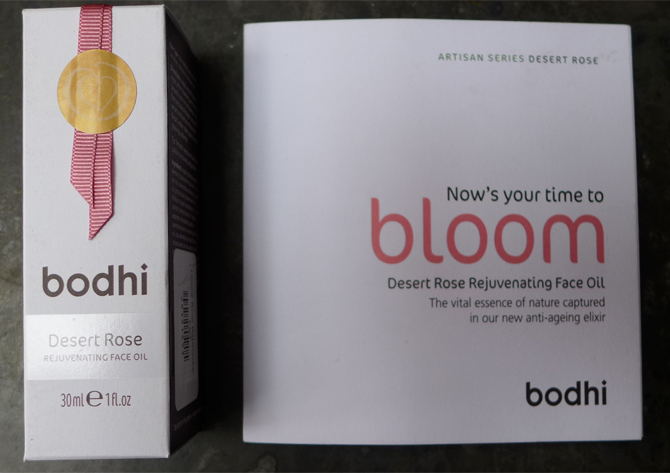 I found another lovely one this week, at the Les Senteurs perfume store in London, it’s called Desert Rose rejuvenating facial oil by Bodhi. It smells gorgeous, leaves your skin beautifully soft and according to the blurb claims to intensely hydrate the skin, which might be useful at this chilly, windy time of the year. It has a little Argan oil in it, as well as rosehip, neroli and evening primrose oil. Available from Les Senteurs for £56.